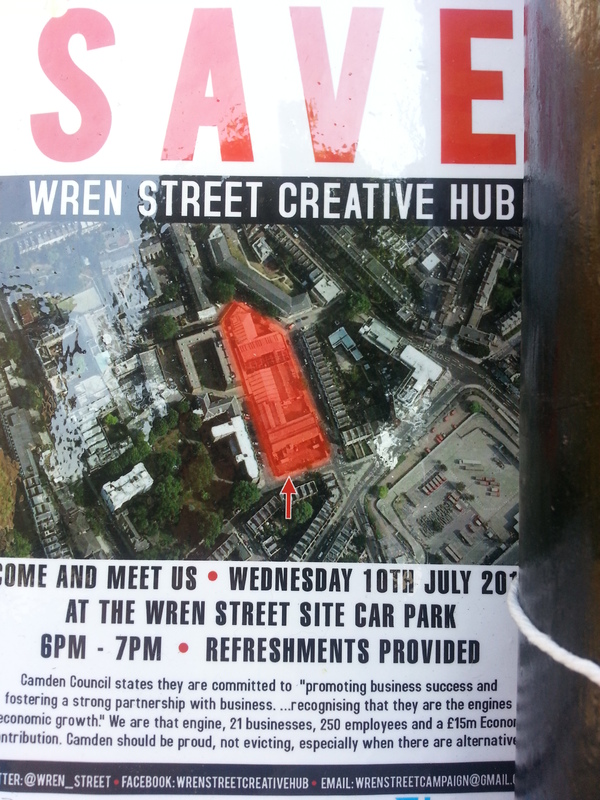 The Wren Street Business Community that is affected by the lack of lease extensions of council owned property to favour the erection of new secondary school in Kings Cross South, have called for a meeting on the 10th of July 2013, between 6 – 7 pm in the Wren Street Car park. Leaflets have been put up around Wren Street which were also seen in the windows of some local residents. A leaflet says that 21 businesses and 250 employees are affected by the non extension of the lease. One has to question aspects of Camden’s strategy the least. From the perspective of businesses it must look strange to have an empty space developed next door on Mount Pleasant and no school being part of the plan there, nor an exchange space for the businesses that will have to move soon. In fact this was one of the comments on this site, after we informed you about the school plans. Other empty spaces like the empty space that is currently a car park in Britannia Street also seem not to have been given wider thought, but to erect another hotel (serving mainly one business owner). At the same time shop units in Cromer Street remain unoccupied, and there are other empty store and office units across the area. Kings Cross needs business regeneration, especially on the South side too. The Kings Cross and St Pancras re-developments have served mainly huge chains, this is also the case for the Brunswick Centre, which only saw a few private businesses survive, mainly on its North side. School and education are crucial to a community, and will serve 1000s, but not soon after that comes the nourishment of vibrant businesses, not the least because businesses have also got a relationship with upholding the level and infrastructure of an area and create revenue. If the only business types that seem to go ahead are another tourist serving newsagent or alcohol selling store, and another hotel, this can hardly be in the interest of Kings Cross residents. In nearby Camden owned Bloomsbury there is 20 Guildford Street, the former University of London Computer Centre, a building that seems not fully occupied since it the computer folks left it. How about this building as a new hub? Even though most of the properties are not owned by the council, surely the council has some persuasion power to promote business development. One of the most exciting projects in that regard is the Shorditch Boxpark, in which Tower Hamlets succeeded to create a vibrant space for a multitude of small open businesses. How Camden Council will pacify and serve the unhappy community of 21 local businesses affected by the non extension of the lease will be an interesting question. Please keep us posted. Today (Mo. 8th July) between 3.30 and 7 pm there is also an open consultation on the school at Calthorpe Project between 3.30 and 7.00 pm. This entry was posted in Local businesses and tagged Brunswick Centre, Business, Camden, Camden Council, University of London Computer Centre. Bookmark the permalink. I think the idea you put forward in this article about using the model of the shoreditch boxpark to promote smaller and/or a variety of businesses that could cater to the local population and contribute to the regeneration of south kings x is excellent ! I think the idea you put forward in this article about looking to the shoreditch box park as a model for promoting smaller and/or a variety of businesses that can cater to a local population in the regeneration of some spots in south kings x is excellent !